What are, on the other hand, the fruits of the God-Man society [the Church]?—Saints, Martyrs, and Confessors. That is its goal, that is its meaning and design, that is the proof of its indestructible strength. Not books and libraries, systems and cities—all things that are here today and gone tomorrow. The various pseudo-Christian humanisms fill the world with books, while Orthodoxy fills it with the hallowed. In the European West, Christianity has gradually transformed into humanism. For a long time and arduously, the God-Man diminished, and has been changed, narrowed, and finally reduced to a man: to the infallible man in Rome and the equally "infallible" man in London and Berlin. Thus did papism come into being, taking everything from Christ, along with Protestantism, which asks the least from Christ, and often nothing. Both in papism and in Protestantism, man has been put in the place of the God-Man, both as the highest value and as the highest criterion. A painful and sad correction of the God-Man's work and teaching has been accomplished. Steadily and stubbornly papism has tried to substitute the God-Man with man, until in the dogma about the infallibility of the pope—a man, the God-Man was once and for all replaced with ephemeral, "infallible" man; because with this dogma, the pope was decisively and clearly declared as something higher than not only man, but the holy Apostles, the holy Fathers, and the holy Ecumenical councils. With this kind of a departure from the God-Man, from the ecumenical Church as the God-Man organism, papism surpassed Luther, the founder of Protestantism. Thus, the first radical protest in the name of humanism against the God-Man Christ, and his God-Man organism—the Church—should be looked for in papism, not in Lutheranism. Papism is actually the first and the oldest Protestantism. We should not do this ourselves. Papism indeed is the most radical Protestantism, because it has transferred the foundation of Christianity from the eternal God-Man to ephemeral man. And it has proclaimed this as the paramount dogma, which means: the paramount value, the paramount measure of all beings and things in the world. And the Protestants merely accepted this dogma in its essence, and worked it out in terrifying magnitude and detail. Essentially, Protestantism is nothing other than a generally applied papism. For in Protestantism, the fundamental principle of papism is brought to life by each man individually. After the example of the infallible man in Rome, each Protestant is a cloned infallible man, because he pretends to personal infallibility in matters of faith. It can be said: Protestantism is a vulgarized papism, only stripped of mystery (i.e., sacramentality), authority and power. Through the reduction of Christianity, with all its eternal God-Man qualities, to man, Western Christianity has been turned into humanism. This may seem paradoxical, but it is true in its irresistible and unerasable historical reality. Because Western Christianity is, in its essence, the most decisive humanism; and because it has proclaimed man as infallible, and has turned the God-Man religion into a humanist religion. And that this is so is shown by the fact that the God-Man has been driven to the heavens, while his place on earth has been filled with his replacement, Vicarius Christi—the pope. What a tragic piece of illogic: to establish a replacement for the everywhere-present God and the Lord Christ! But this piece of illogic has been incarnated in Western Christianity: the Church has been transformed into a state, the pope has become a ruler, bishops have been proclaimed princes, priests have become leaders of clerical parties, the faithful have been proclaimed papal subjects. The Gospel has been replaced with the Vatican’s compilation of canon law; Evangelical ethic and methods of love have been replaced with casuistry, Jesuitry and the "holy" Inquisition. What does all this mean? With the systematic removal and destruction of everything that does not bow to the pope, even with forced conversions to the papal faith, and the burning of sinners for the glory of the meek and the mild Lord Jesus! There is no doubt that all these facts converge into one irresistibly logical conclusion: in the West there is no Church and no God-Man, which is why there is no true God-Man society in which men are mortal brothers and immortal fellows. Humanistic Christianity is actually the most decisive protest and uprising against the God-Man Christ and all the Evangelical, God-Man values and norms. And even here is evident European man’s favored tendency, to reduce everything to man as the fundamental value and the fundamental measure. And behind that stands one idol: Menschliches Allzumenschliches. With the reduction of Christianity to humanism, Christianity has been no doubt, simplified, but also at the same time—destroyed! Now that the "gleischaltung" of Christianity with humanism has been accomplished, some in Europe are seeking a return to the God-Man Christ. However, the cries of individuals in the Protestant world—"Zuruck zum Jesus! Back to Jesus! "—are empty cries in the dark night of humanistic Christianity, which has abandoned the values and the measures of God-Man and is now suffocating in desperation and impotence. While from the depths of centuries past reverberate the bitter words of the melancholic prophet of God, Jeremiah: "Accursed is the man who puts his confidence in man!..." In a broader historical perspective, the Western dogma about man’s infallibility is nothing other than an attempt to revive and immortalize dying humanism. It is the last transformation and final glorification of humanism. After the rationalistic Enlightenment of the 18th century and the shortsighted positivism of the 19th century, nothing else was left to European humanism than to fall apart in its own impotence and contradictions. But in that tragic moment, religious humanism came to its aid with its dogma about the infallibility of man saved European humanism from imminent death. And, although dogmatized, Western Christian humanism could not help absorbing all the fatal contradictions of European humanism, which are united in one single desire: to exile God-Man from the earth. Because the most important thing for humanism is for man to be the highest value and the highest measure. Man, not God-Man. According to our own Orthodox feeling: Christianity is only Christianity through the God-Man, through His God-Man ideology and God-Man methods. That is the fundamental truth for the sake of which no compromises can be made. Only as the God-Man is Christ the highest value and the highest measure. One should be truthful and consistent to the end: if Christ is not the God-Man, then he is the most impudent fraud, because he proclaimed himself as God and the Lord. But the Evangelical historical reality irrefutably shows and proves that Jesus Christ is in everything and in all things the perfect God-Man. Therefore, one cannot be a Christian without a belief in Christ as God-Man and in the Church as His God-Man Body, in which He left His entire Miraculous Person. The saving and life-giving power of Christ’s Church lays in the eternally-living and all-present personality of the God-Man. Any substitution of the God-Man with a man, and any winnowing of Christianity in order to pick out only that which pleases a man’s individual preference and reason, turns Christianity into shallow and impotent humanism. The outstanding importance of Christianity for making lies in its life-giving and unchangeable God-Manhood, by which it models humanity as a whole, bringing it from the darkness of non-being to the light of Pan-being. Only by its God-Man power is Christianity the salt of the earth, the salt that saves man from rotting in sin and evil. If it dissolves into various humanisms, Christianity becomes bland, becomes salt that has turned flat, useless, fit to be tossed out and trod on. Any tendency or attempt at a "gleischaltung" of Christianity with the spirit of the times, with ephemeral movements and regimes of certain historical periods, takes away from Christianity that specific worth which makes it the singular God-Man religion in the world. In the Orthodox philosophy of society, the rule above all rules is this: do not accommodate the God-Man Christ to the spirit of the times, but rather accommodate the spirit of the times to the spirit of Christ’s eternity—Christ’s God-Manhood. Only in this way can the Church preserve the life-giving and irreplaceable personality of the God-Man Christ and remain a God-Man society, in which people fraternize and live with the help of Divine love and justice, prayer and fasting, meekness and humbleness, goodness and wisdom, charity and faith, love of God and love of one’s brother, and all the other Evangelical virtues. According to the God-Man philosophy of life and the world, man, society, nation, and state are to accommodate themselves to the Church as the eternal ideal, but the Church must never accommodate itself to them—much less submit to them. A nation has true worth only inasmuch as it lives the Evangelical virtues and incarnates in its history the God-Man values. What applies to the nation, applies to the state as well. The goal of the nation as a whole is the same as the goal of the individual: to incarnate in one's self Evangelical justice, love, sanctity; to become a "holy people"—"God’s people"—which in its history proclaims the Divine values and virtues (1 Peter 2:9-10; 1:15-16). They will ask us: where are the concrete fruits of this God-Man society? How was it that precisely on the field of Orthodoxy’s radiation came about the appearance of "the most radical secularism in human history?" (Joseph Piper) Does there not also exist an Eastern "Humanism" (for ex. Caesaro-papism, etc.)? The success of atheistic social humanism on the soil of Orthodoxy: is that not proof of the "inability of Orthodoxy" to solve the most elementary social problems? It is a fact that this world lies in evil and sin. The reduction of everything to man is in fact the atmosphere in which sinful human nature and man in general—no matter where he is located—lives and breathes, and something toward which they strive. It is, therefore, no wonder that the tides of this sinfulness, just like the tides of European pseudo-Christian poisons, from time to time wash over the Orthodox peoples as well. However, one thing is irrefutably true: the Orthodox church has never ecclesiologically dogmatized any sort of humanism, whether we are talking about Caesaro-papism or any other "ism." With the strength of its genuine and uncorrupted God-Manhood and Evangelical truthfulness, and through its constant call for repentance regarding everything that is not from God-Man, it has preserved, by the power of the Holy Spirit, the wisdom and the chastity of its heart and its soul. And by this it has remained and continues to be the "salt" of the earth, man and society. On the other hand, the tragedy of Western Christianity lies precisely in the fact that it, either by correcting the image of the God-Man, or by denying it, has attempted to once again introduce demonized humanism, so characteristic of sinful human nature, to—where? Into the heart of the God-Man organism itself—the Church, whose essence lies precisely in the freeing of man from it. And through it into all regions of life, person and society, proclaiming it as the supreme dogma, as the universal dogma. With this, the demonized intellectual pridefulness of man, hidden under the cloak of the Church, becomes the dogma of a faith without which there is no salvation! It is horrible to think it, much less say it: with this, the sole "workshop of salvation" and graduation to God-Manhood in this world, is gradually turned into a demonized "workshop" of violence over consciousness and dehumanization! A workshop of the disfigurement of God and man through the disfigurement of the God-Man! The Orthodox Church has proclaimed no poison, no sin, no humanism, no earthly social system as dogma—neither through Councils, nor through the "Body" of the Ecumenical Church. While the west, alas, does nothing but that. 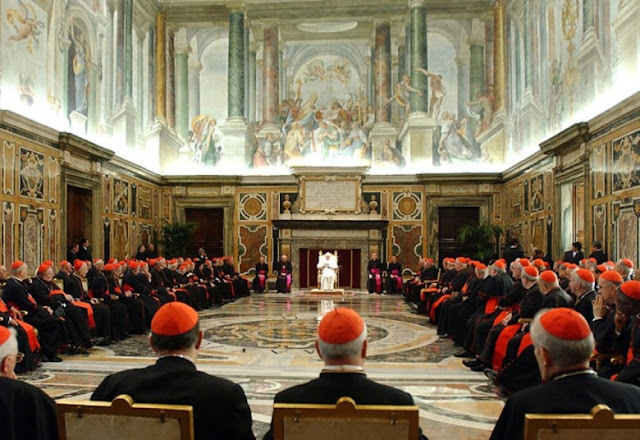 The latest proof: the Second Vatican Council. The Orthodox Faith: in it, repentance is a necessary holy virtue; and it always calls for repentance. In the West: the pseudo-Christian faith in man does not call for repentance; on the contrary, it "clerically" obligates a maintaining of its fatal-to-man homo-idolization, its pseudo-Christian humanisms, infallibilities, heresies, and it pridefully considers that in no case are these things for which one should repent. Contemporary atheistic social humanism—ideologically and methodologically—is in everything a fruit and an invention of pseudo-Christian Europe, wed with our own sinfulness. They ask us: how did it arrive on the soil of Orthodoxy? It is God trying the endurance of the righteous, visiting the children for the sins of their fathers, and announcing the strength of His Church by taking it through fire and water. Because, according to the words of the wise-in-God Macarius of Egypt, that is the only path of true Christianity: "Wherever the Holy Spirit is, there follows, like a shadow, persecution and battle... It is necessary that the truth be persecuted." What are, on the other hand, the fruits of the God-Man society?—Saints, Martyrs, and Confessors. That is its goal, that is its meaning and design, that is the proof of its indestructible strength. Not books and libraries, systems and cities—all things that are here today and gone tomorrow. The various pseudo-Christian humanisms fill the world with books, while Orthodoxy fills it with the hallowed. Thousands and hundreds of thousands, even millions of martyrs and newly martyred, fallen for the Orthodox faith—there is the fruit of God-Man society. Thus does the famous Francois Mauriac, a Roman Catholic, on the dark horizon of the contemporary world, with each day more and more pushed into the darkness of born-in-Europe, soul-losing homo-idolatry, see only one bright spot, that gives hope for the future of this world: the bathed in the blood of the martyred and newly-martyred faith. The Orthodox faith. But in the West? They neither know the Church, nor the path, nor the way out of the hopelessness; all is sunk in soul-losing idolatry, in love of pleasure, love of self, and love of lust. Hence in Europe we see the renaissance of polytheism. The "False Christs," false gods that have flooded Europe and are exported from it to all the marketplaces of the world, have for their main assignment the killing of the soul in man—that unique treasure of man in all the worlds, and in that way make impossible the very possibility of a genuine society. In writing this, we are not writing the history of Europe, its virtues and faults, nor the history of the European pseudo-churches. We are merely laying out the entelechy of its ontology, descending into the pith of European intellectual pridefulness, into its demonic underground, where its black sources are, whose water threatens to poison the world. This is not a judgment of Europe but a heartfelt prayerful call to the solitary path of salvation, through repentance. From the book The Orthodox Church and Ecumenism, by Archimandrite Justin Popovich. Ecumenism is the common name for the pseudo-Christianity of the pseudo-Churches of Western Europe. Within it is the heart of European humanism, with Papism as its head. All of pseudo-Christianity, all of those pseudo-Churches, are nothing more than one heresy after another. Their common evangelical name is: Pan-heresy. Why? This is because through the course of history various heresies denied or deformed certain aspects of the God-man and Lord Jesus Christ; these European heresies remove Him altogether and put European man in His place. In this there is no essential difference between Papism, Protestantism, Ecumenism, and other heresies, whose name is "Legion." Orthodox dogma, that is to say the overriding dogma of the Church, is rejected by them and replaced by the Latin heretical overriding dogma of the primacy and infallibility of the Pope, that is to say of man. 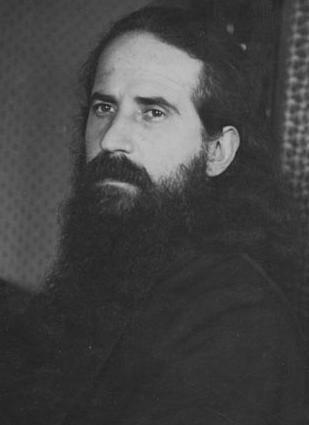 From this pan-heresy heresies were born and continue to be born: the Filioque, the rejection of the invocation of the Holy Spirit, unleavened bread, the introduction of created grace, cleansing fire, superfluous works of the saints, mechanized teachings about salvation, and from this sprang mechanized teachings about life, Papocaesarism, the Inquisition, indulgences, the murder of sinners because of their sins, Jesuitism, the scholastics, the casuists, Monarchianism, and social individualism of different kinds..."
From the chapter "Humanistic Ecumenism" in Orthodox Faith and Life in Christ, by Father Justin Popovich, trans. by Asterios Gerostergios (Belmont, MA: Institute for Byzantine and Modern Greek Studies, 1994), p. 169.